After two months at sea, sailing all the way from Norway to Iceland, Greenland and Canada, Draken Harald Hårfagre has reached US waters. The ship is the worlds largest Viking ship sailing in modern times. She was greeted by thousends of people when she went through Welland canal, the last passage through Canadian waters before the sail across lake Erie. On Thursday 7th of July 2016 she will reach Fairport Harbor to celebrate the first stop of Tall Ships Race in the United States between July 8-10. Draken and her crew left Norway by the end of April and along the voyage they have encounterd storms, icebergs, extreme challenges. – I´m proud of the crew and the achievements we have made along the way. It has not been easy, we have faced a lot of problems along this voyage but the crew have been in good spirit and worked hard all the way, says Capt. Björn Ahlander. 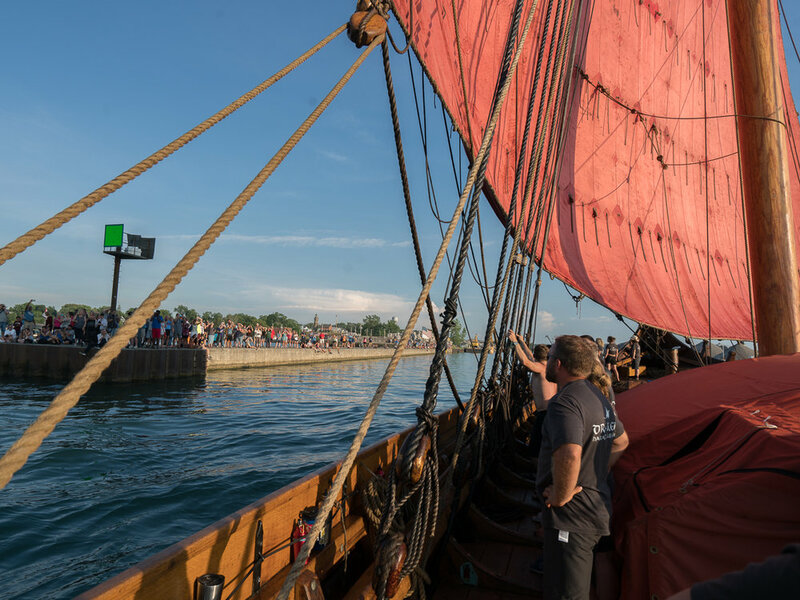 During the Tall Ships Race stop in Fairport Harbour the public will be allowed to step onboard the world’s largest Viking ship, a chance that dont come often.